Have you ever wanted to enter the ring against Frazier, Ali, your boss, or maybe your in-laws, but weren't sure if you would match up? Well now you can take on the biggest guy on the block with the most hilarious equalizers around. You put on these enormous boxing gloves and enter an inflatable ring. 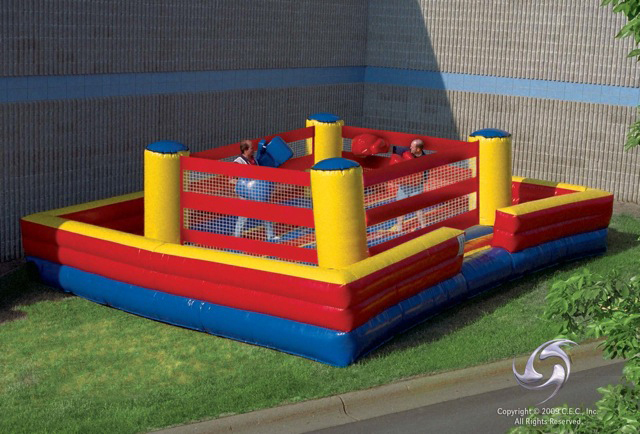 Two competitors climb into a 24'L X 24'W X7'T colored boxing ring and put on the BIG foam filled boxing gloves and box under the guidance of our referee. A great stress reliever, you can really pack a wallop with this event.